Last week, CCR co-hosted a convening of lawyers, activists, and academics from the United States and South Africa, together with our partners at the Socio-Economic Rights Institute of South Africa (SERI) and the Bertha Foundation. In this dangerous political moment in the United States, the purpose was to bring people from the two countries together to consider how we can creatively wield the law to create political spaces that ensure basic civil rights, and to defend the hard-won gains movements have made. Before the convening officially began, CCR partnered with local public defenders to bring the South African delegation to observe local arraignments at Manhattan Criminal Court, which laid the ground for the comparative discussions to come. At the convening, the delegation shared their impressions of the adjudication of minor crimes, the criminalizing of Black and Latinx New Yorkers through broken windows policing, and the harmful use of high bail that keeps people who cannot pay in jail. The two-day gathering included six themed sessions with presenters from the U.S. and South Africa as well as a case study for participants to explore. This session focused on contemporary crises of migration and racism in the two jurisdictions. Participants explored how activists and movement lawyers can force the state to protect freedom of movement, ensure access to counsel for migrants, provide asylum at borders, and enforce refugee convention protections. Panelists discussed the successes of South African and U.S. legal tools and strategic litigation to challenge immigrant detention centers and to resist systemic racism. Panelists included (from left to right): Carl Lipscomb—Black Alliance for Just Immigration, Sheldon Magardie—Legal Resources Center, Wayne Ncube— Lawyers for Human Rights, and Julian Brown—Wits University. In this session, panelists discussed the impact of climate disasters in the context of state-sanctioned exploitation. In the past few months, a number of regions in the United States have been severely affected by climate change. The most damaged of these regions has been Puerto Rico—a colony of the US. In the aftermath of the (unnatural) environmental disaster, the ambiguous status of the colony has come to the fore: government neglect has combined with predatory capitalism to create a state of exception in the disaster-struck region, in which ordinary processes of the law seem to have been suspended or disregarded. In South Africa, regular disasters like shack fires and floods in informal settlements—which are themselves largely unrecognized and unregulated by the state—create comparable crises. Climate disasters expose the limits of the legal framework for poor and/or colonized citizens of the U.S. and South African states. Panelists in this session scrutinized the legality and repercussions of the rapidly growing privatization of social services and public spaces in both jurisdictions, drawing out how budgeting priorities are politicized at the cost of communities’ wellbeing. 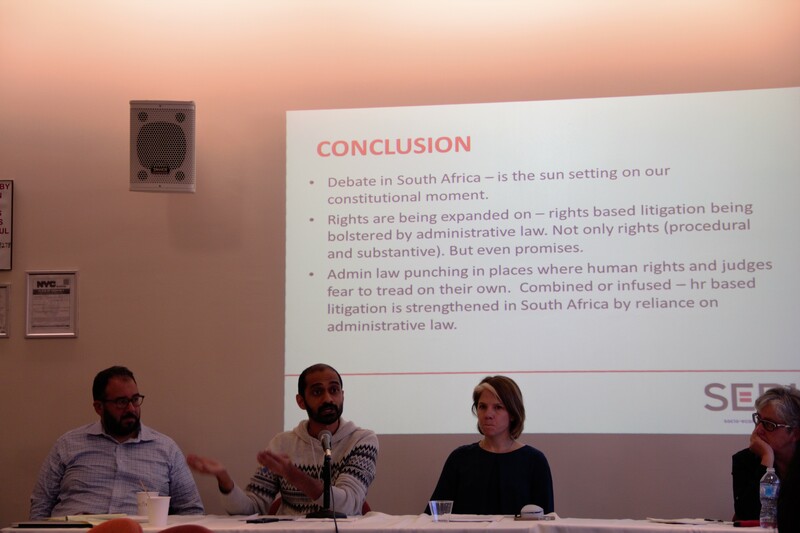 They discussed ways to challenge the lack of justiciable economic, social, and cultural rights in the U.S. context and overcome the limits of enforceability in South Africa. Panelists also shared legal and administrative strategies to challenge corporate human rights abuses in the United States. Panelists included (from left to right): Kumar Rao—Center for Popular Democracy (CPD), Dmitri Holtzman—CPD, Zeenat Sujee—Center for Applied Legal Studies, Cathy Albisa—National Economic & Social Rights Initiative , and Nomzamo Zondo—SERI. The second day of the convening started with a critical panel examining community resistance to police violence, from the Movement for Black Lives to Fees Must Fall. Panelists examined the role of lawyers in supporting such movements, and shared ideas and tools for fighting a culture of violent policing. Participants explored the different contemporary contexts in which social movements are operating—in the U.S., where communities are contending with an emboldened white supremacist agenda, and in South Africa, where steps have been taken to limit expression that evokes the racial hatred of apartheid. Participants explored the jurisprudential differences and outcomes concerning the balance of free speech and racism in the context of police violence, and strategies to protect popular resistance. Panelists included (from left to right): Lumumba Bandele—CCR Board Member, NAACP Legal Defense and Educational Fund and Malcolm X Grassroots Movement, Marbre Stahly-Butts—Law for Black Lives, Stuart Wilson—SERI, Vince Warren—CCR. In this session, panelists discussed Boycott, Divestment and Sanctions (BDS) campaigns aimed at addressing Israel’s oppression of Palestinians, which have sparked fevered debates about the limits of political speech. They also explored how the BDS movement draws upon the history of anti-apartheid struggle within and outside South Africa, in particular the cultural, sports, and economic boycotts of the 1970s and 1980s. Panelists included (from left to right): Noor Nieftagodien—Wits, Maria LaHood—CCR, and Mbekezeli Benjamin— Equal Education Law Centre. The last session discussed the successes and failures of administrative justice in regimes that suppress human rights. In the contemporary U.S. context, the Trump administration’s attempts to impose a Muslim ban, to roll back social and environmental protections, to destroy immigrant communities through deportation and other targeting, and to dismantle efforts to achieve racial justice in policing all represent such failures. In the South African context, recent attempts to withdraw from the International Criminal Court, ignore the recommendations of the Public Protector regarding government misconduct, and disregard applicable informal settlement policy have had similar effects. Panelists discussed the possibilities and limitations of administrative law challenges to state policy, and how legal and political tactics can converge to bolster movement needs. Panelists included (from left to right): Baher Azmy—CCR, Fahd Ahmed—DRUM - South Asian Organizing Center, Amy Taylor—Make the Road NY, Anna-Marie de Vos—Advocate, and Irene De Vos—SERI (not pictured). Our two days together laid the foundation for growing alliances and deeper learning about our histories of struggle. We compared experiences of systemic racism and violence across South Africa and the United States, and explored strategies and tactics for action by movements and movement lawyers. It is our hope that this is only the beginning of collaboration!